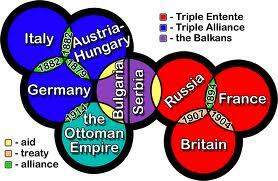 Austria-Hungary is allied with Germany, Ottoman Empire and Bulgaria as the Central Powers. It was bound with Germany by a treaty signed in 1879, and Italy in 1882. Italy remained neutral, arguing that the treaty is a defensive one, not a aggressive treaty. But on 23 May, 1915 Italy turned against Austria-Hungary, because of land disputes in northern Italy(south Tyrol, Trieste), in which Austria-Hungary refused to give up land claimed by Italy. Ottoman Empire (28 Oct, 1914) and Bulgaria (11 Oct, 1915) joined the war because of their pro-German governments and economies that strongly relied on Germany.